Tom has been visiting Ebekawopa since 2006, when Peter Sewornoo, an old friend, introduced Tom to the village; Rev. Sampson, the Lutheran minister, has hosted Tom and his visitors ever since. 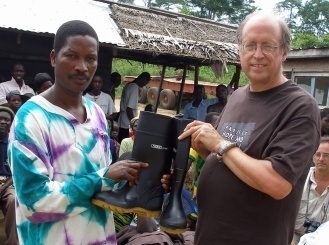 Since 2006, Tom has donated $400 of tools annually and the village made Tom Nkorsorhene (Development Chief) in 2008. We are hoping to purchase a cocoa butter extractor ($6000) in 2015 and a diesel generator to run it ($3,000) so that the village can press cocoa beans that won't sell well on the market and derive profit from them.